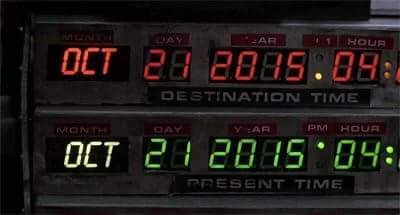 Today, Wednesday, Oct. 21, 2015, at 4:29 PM, our today will finally catch up to the tomorrow in “Back to the Future II.” The 1989 film had Marty McFly (Michael J. Fox) and Dr. Emmett Brown (Christopher Lloyd) appear with a flash in their DeLorean time machine from 30 years in the past. Well, sadly cars cannot fly, we have no hoverboards (sort of) and well the Cubs are one game from NOT going to the World Series. In 5 hours and 29 minutes, we will be in The Present! And now a message from Doc Brown! Your Future is what you make of it, so make it a Good one!